Christmas and New Year is a time where there is an abundance of food and beverage as you gather around with family and friends to celebrate. As tasty as the food may be, it may cause harm to your counter tops or floors if they are calcite based stone like marble, travertine, limestone or onyx. Though rare, even some granite countertops may have mixed stone properties and possibly have some calcite within the stone. We created a pH scale of common household items and food that shows their pH level. 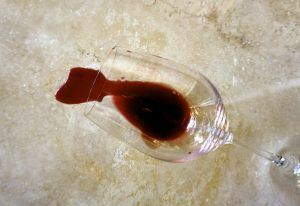 Understanding pH helps prevent damaging reactions certain items may cause to your stone. On a positive note, understanding pH can help you improve the maintenance of your counters and floors. Take a look at the scale we provided. Items that fall between 0 and 6.9 are considered acids and may cause etching to certain stones, while items between 7.1 and 14 are alkaline and can leave behind a sticky residue if it is not cleaned correctly. If the item has a pH of exactly 7 then the item is considered neutral, meaning it is not acidic nor alkaline. Since 7 is neutral, it has an ionic strength of 0. For each pH level you decrease, meaning the acidic level is getting stronger, you multiply the strength by 10. If you are increasing the pH level then you would divide the strength by 10. First we will discuss the acids, as these can be the most damaging to your natural stone. A common food item served around this time of year is cranberry sauce. If you notice cranberry sauce has a pH of 2, meaning it is very acidic. When left on a calcite stone, the acid in the cranberry sauce will change a smooth surface to rough, leaving behind what is called an “etch”. This is often confused as a stain that can’t be removed when in fact, using the proper techniques and patience, they can. An easy way to determine if you have a stain or etch on stone is by color. Stains darken the stone and etches corrode the stone leaving it a lighter color. Etches are more easily identified when viewed from an angle with light reflecting on the surface. If the etch is deep, it may require a professional with several steps of diamonds to restore the area. For video click: How to remove etch from polished marble. 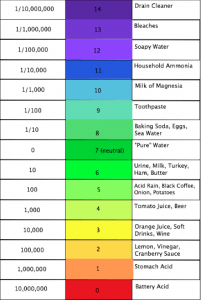 On the other side of the pH scale you have alkaline substances. Most alkaline cleaners can leave residue unless neutralized and/or properly rinsed. Using the soapy dish sponge to wipe the kitchen counters often leaves a residue once the water evaporates. This can cause a couple of problems. Over time the agitation of an alkaline cleaner will assist in removing a top layer of the sealer on your counters and if left to dry on the surface may eventually contribute to dulling the counters shine. The shine on a polished countertop can look dull from scratches, residue left on the counter and of course, previously mentioned etching. The most common cleaners used on floors is an alkaline detergent added to mop water. In the short term, the soapy water collects some of the dirt leaving the tile looking clean. If the soapy water is allowed to puddle and is not completely removed, the dirty soap water may settle into the grout lines or holes in porous stone. As the water evaporates the dirt and soap remains. Since soap is on the alkaline side of the pH scale, when it dries it leaves behind a slightly sticky residue. This in turn causes more dirt to stick to the surface. This buildup, over time, produces dirty grout and stone and can harbor bacteria. Besides becoming unsightly, the bacteria build-up can produce odors. What is a Neutral Cleaner? Neutral cleaners are a pH of 7. If you notice on the chart, distilled water is a pH of 7. When looking for products to clean your floors look for the words “neutral,” “residue free,” and “pH 7” on product labels. With a residue free neutral cleaner you will not leave behind any acidic or alkaline residue that could damage your floors. The method we recommend to clean and maintain your stone and ceramic floors is use a spray bottle with neutral cleaner and a microfiber mop. Lightly spritz neutral floor cleaner on your floor and let it sit for a minute so the solution can grab the dirt. Use a micro fiber towel on the counters and a micro fiber mop on your floors to pick up the dirt. This picks up the cleaner with the dirt and minimizes the amount of dirty liquid that may get into the grout lines or holes in a stone floor. When you are through cleaning your floors you can throw your micro fiber pads in the washer and use it time and time again. Using neutral cleaners also leave your counters and floors residue free which allows the light to reflect and produce the attractive shine. Try this method for an improved short and long term maintenance of your hard surfaces.